Designed by the Mikoyan Design Bureau in the early 1950s, the MiG-19 (Farmer) was the Soviet's first true supersonic jet fighter. Here in one expert volume, the authors describe the MiG-19's development, performance, operational history, and Cold War-era combat actions. Featuring over 600 photos, tech drawings, and color profiles, this new book in the Famous Russian Aircraft series is certain to please both aviation enthusiasts and modelers. Created by the famous Mikoyan Design Bureau in the early 1950s, the MiG-19 fighter was the Soviet Union's first true supersonic fighter that could exceed Mach 1 in level flight. The baseline version with conventional elevators (known to the West as Farmer-A) achieved initial operational capability with the Soviet Air Force as early as 1954, concurrently with its American counterpart, the F-100 Super Sabre. Vertical maneuverability was soon found to be inadequate and led the Mikoyan OKB to create a version with an all-flying horizontal tail--the MiG-19S Farmer-C day fighter, which was built and operated on a much wider scale. The radar-equipped first Soviet supersonic all-weather interceptor, the MiG-19P soon followed together with the MiG-19PM armed with a quartet of beam-riding air-to-air missiles. Special versions also included the SM-50 and SM-51 prototypes equipped with a liquid-fuel rocket booster to improve high-altitude performance and the SM-30 with a zero-length launch capability. In addition to serving its home country, the MiG-19 was exported to the Soviet Union's Warsaw Pact allies including China who created its own variants which had no Soviet equivalent such as the JJ-6 trainer and the radical Q-5 attack aircraft. 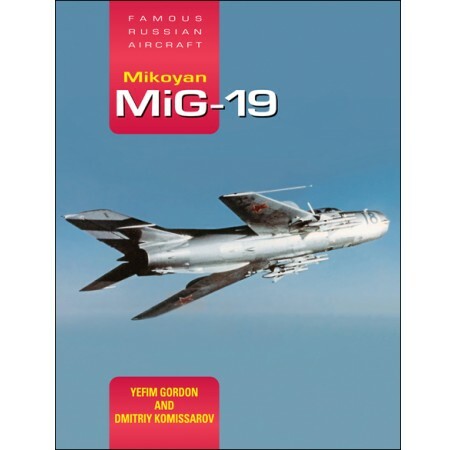 In this latest book in the Famous Russian Aircraft series, the authors describe the MiG-19's development and its operational history at home and abroad including its involvement in conflicts in Asia and the Middle East. Over 600 black and white and color photos, many hitherto unpublished combine with color side views and cutaway drawings to provide a detailed insight for historians and modelers alike. 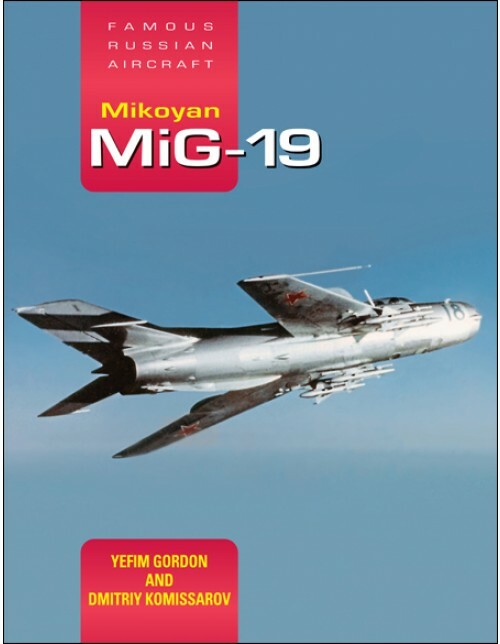 "Whether you're looking for the best reference to tackle Trumpeter's 1/32 MiG-19 or fill in the gaps of when/how/why certain avionics, weapons, or other distinctive capabilities first appeared into the Mikoyan family tree, this title will fill the gap between Gordon's MiG-17 and MiG-21 references." Dmitriy Komissarov was born in 1968 in Moscow and graduated from the Moscow State Linguistics University in 1992. He has worked as a translator ever since, with the most of his work associated with his interest in aviation. Dmitriy Komissarov has authored two books and translated or co-authored more than 50 others. He has also written numerous magazine features in two languages on Soviet and Russian aviation. Yefim Gordon was born in 1950 in Vilnius, Lithuania (then part of the Soviet Union) and graduated from the Kaunas Polytechnic Institute in 1972. He has been researching Soviet and Russian aviation history for more than 40 years and has collected one of the world's largest photograph and document archives on the subject. A professional aviation journalist and photographer since 1989 Yefim Gordon has published hundreds of features and photographs in Soviet and Russian aviation which are published in seven countries. Currently Yefim is Executive Director of the Moscow-based aviation publishing house Polygon Press Ltd and is contactable at yefimair@gmail.com. Get exclusive discounts, product updates and news delivered to your email. © 2016 SpecialtyPress Inc. All Rights Reserved.